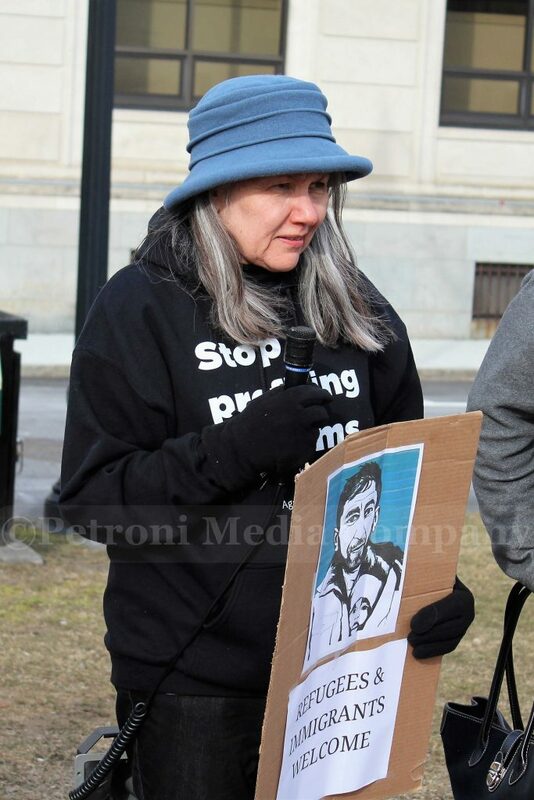 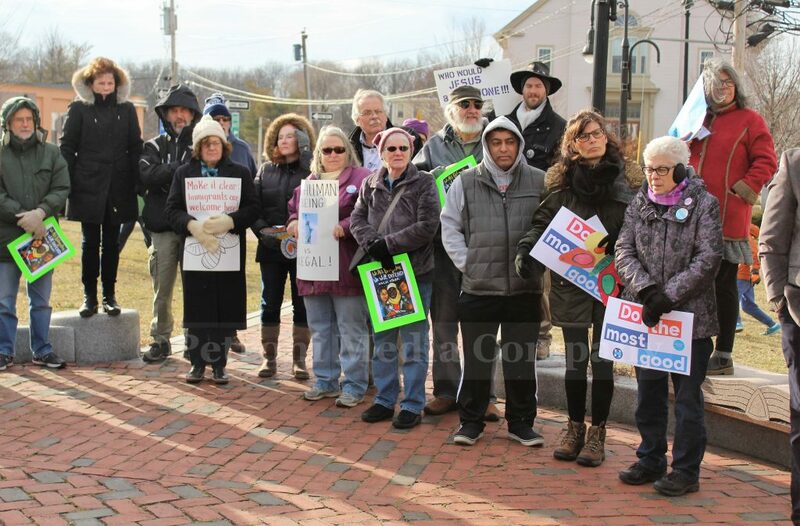 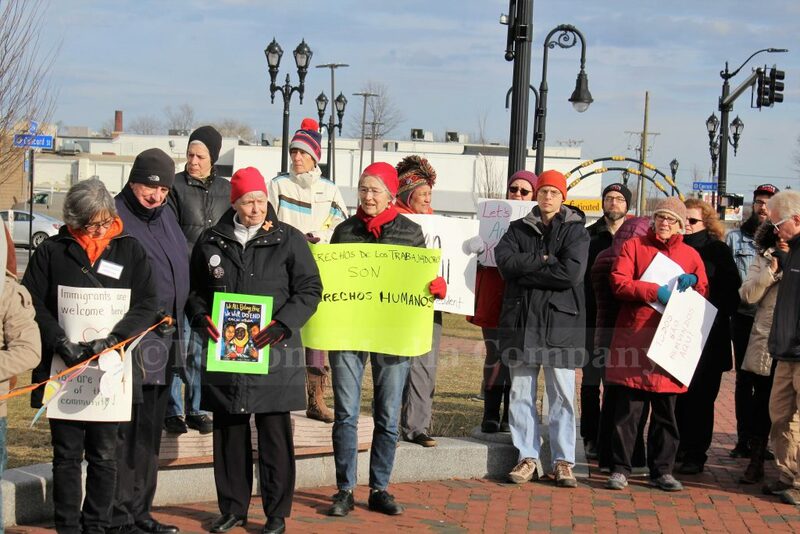 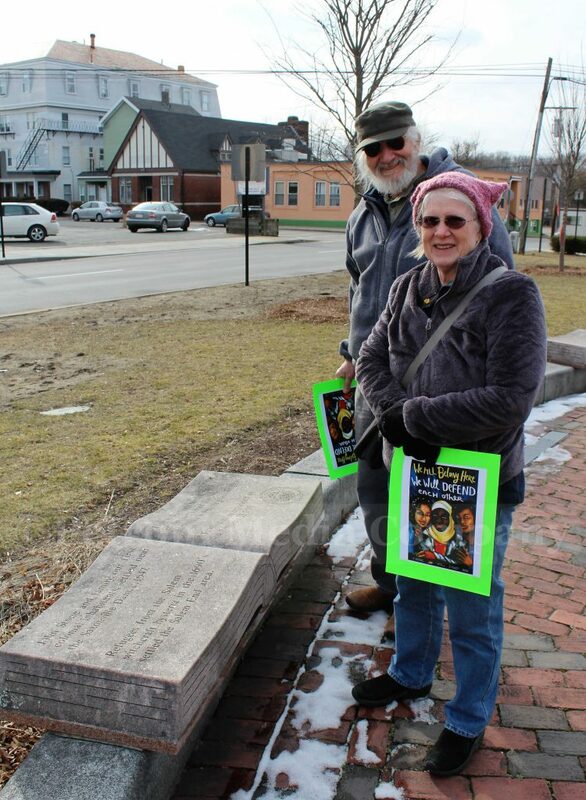 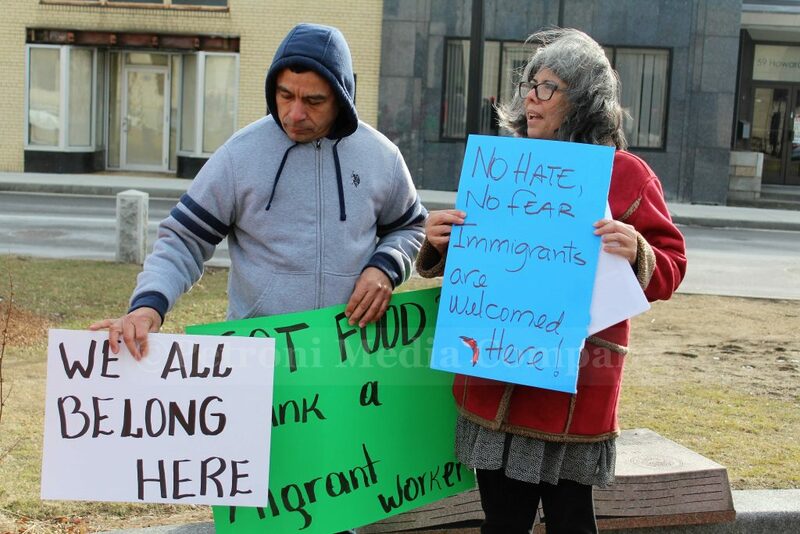 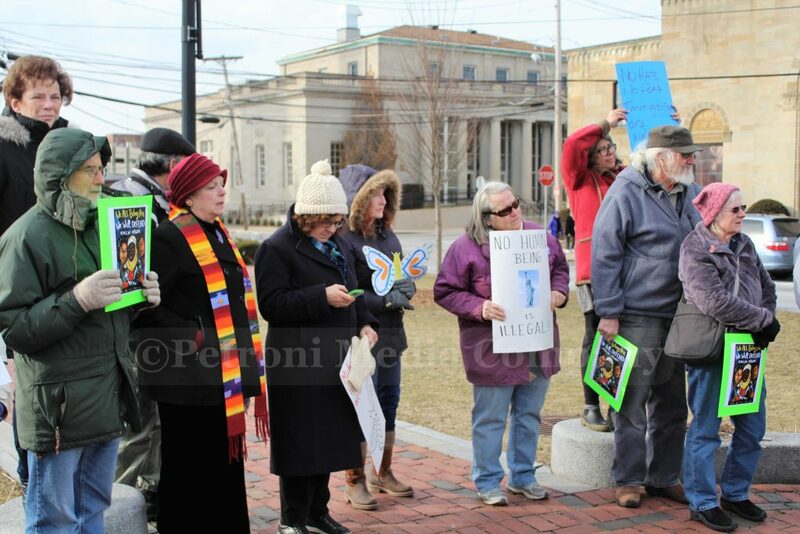 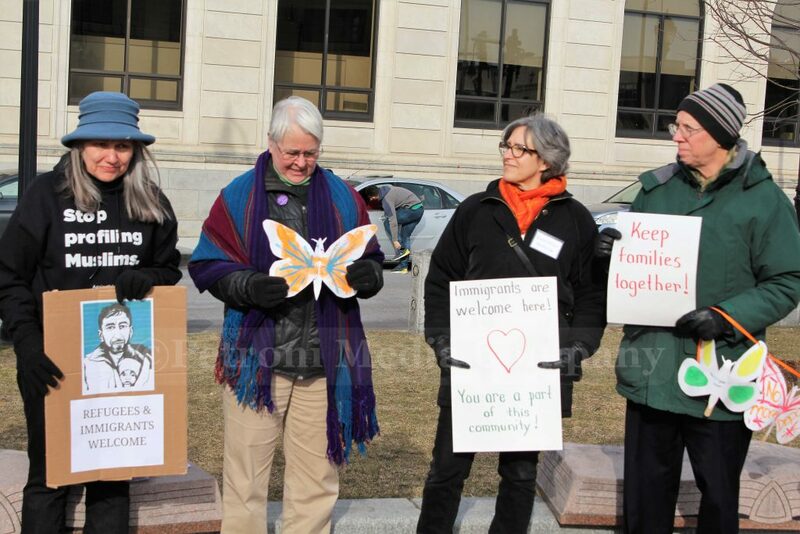 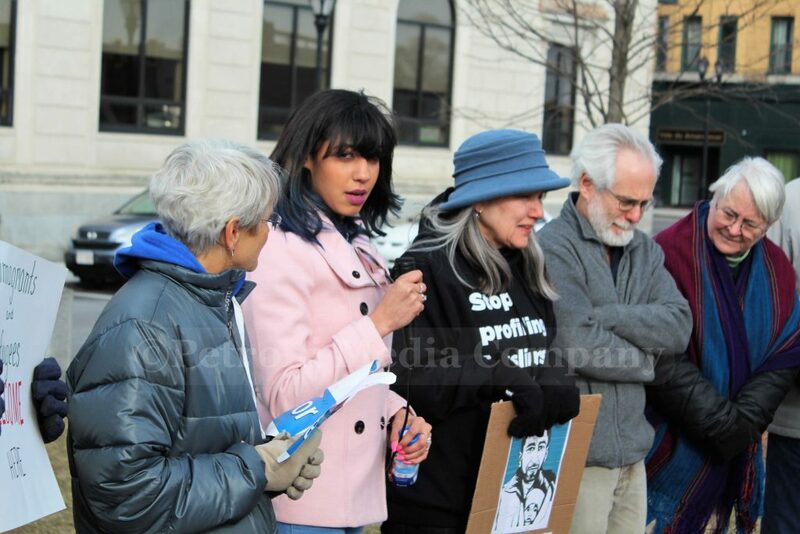 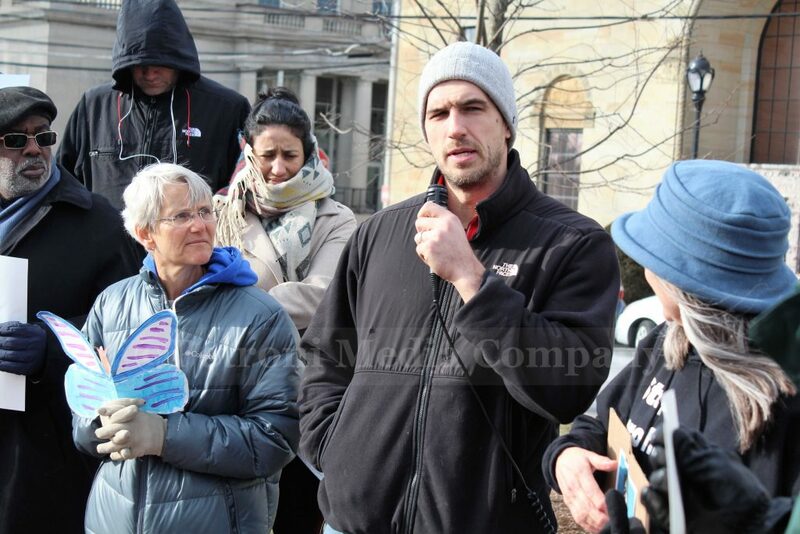 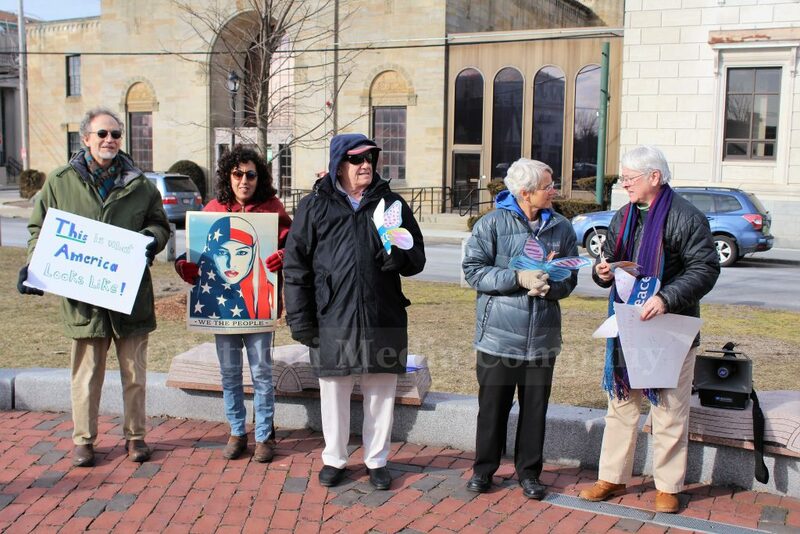 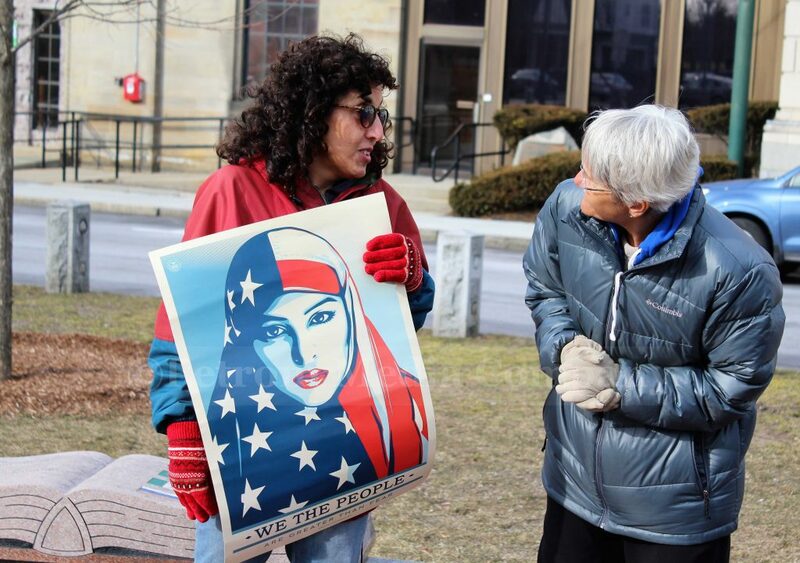 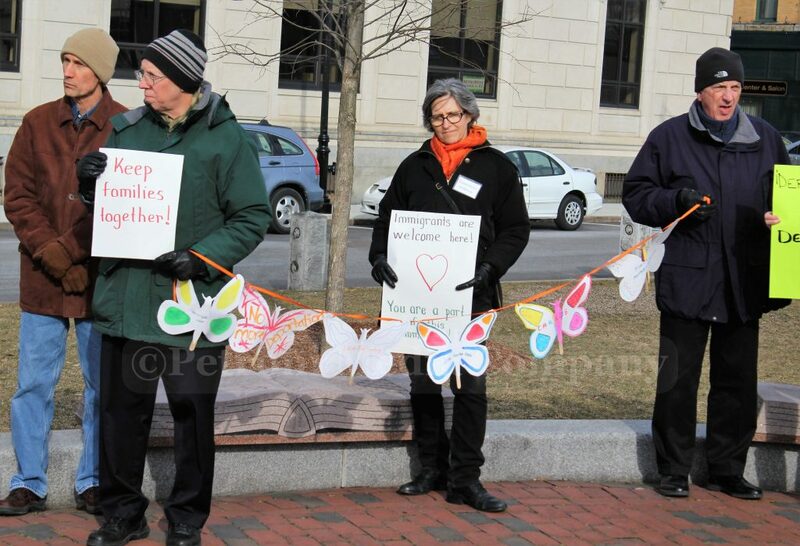 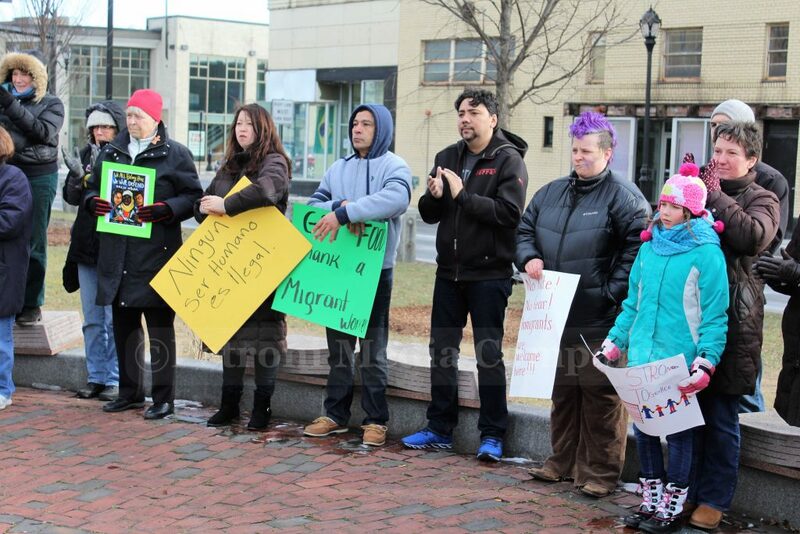 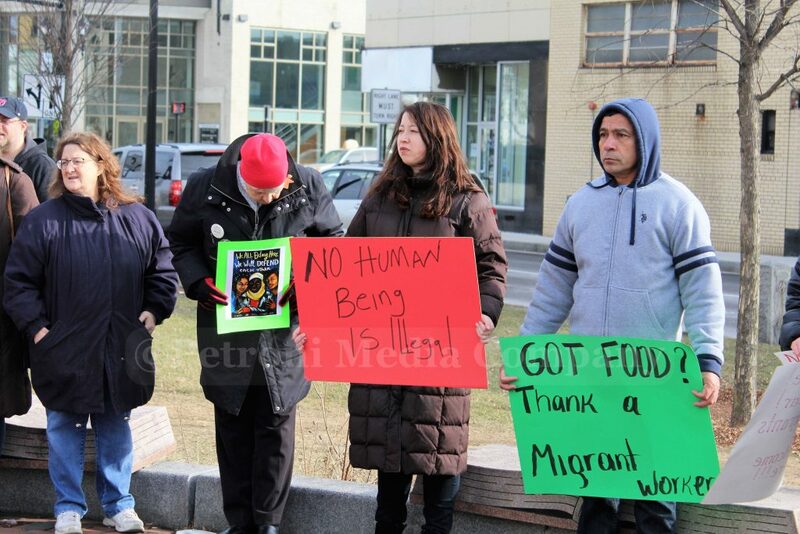 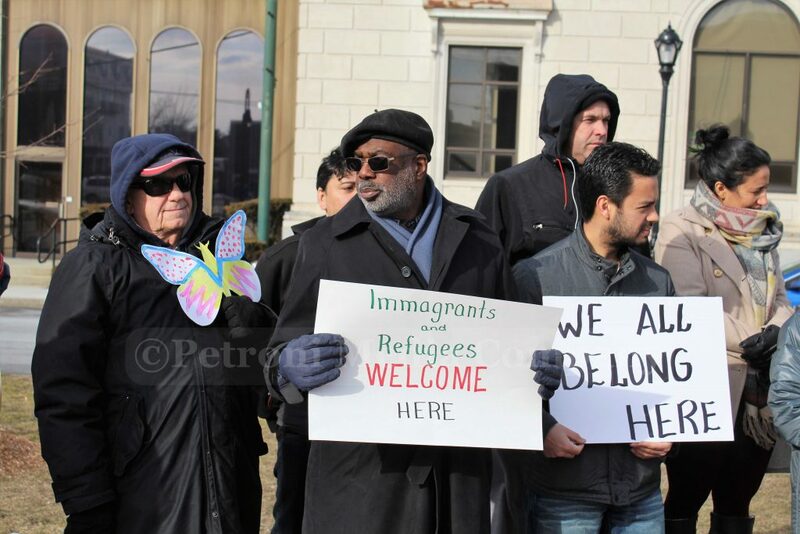 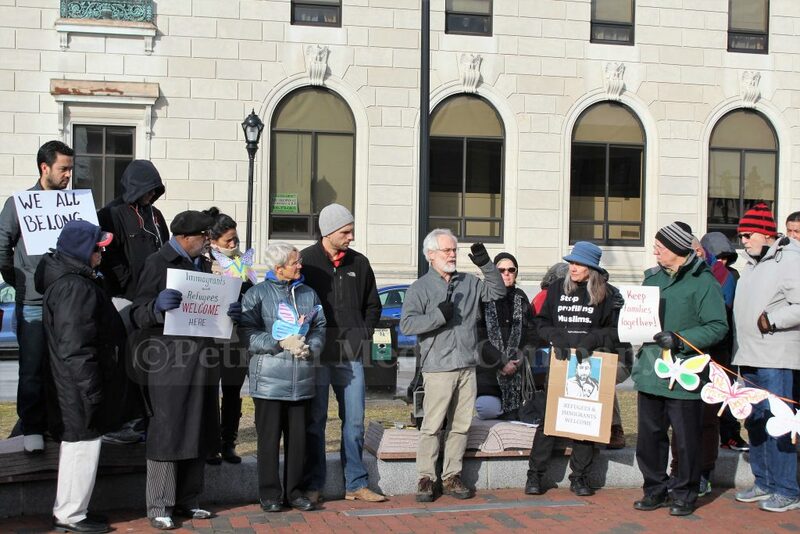 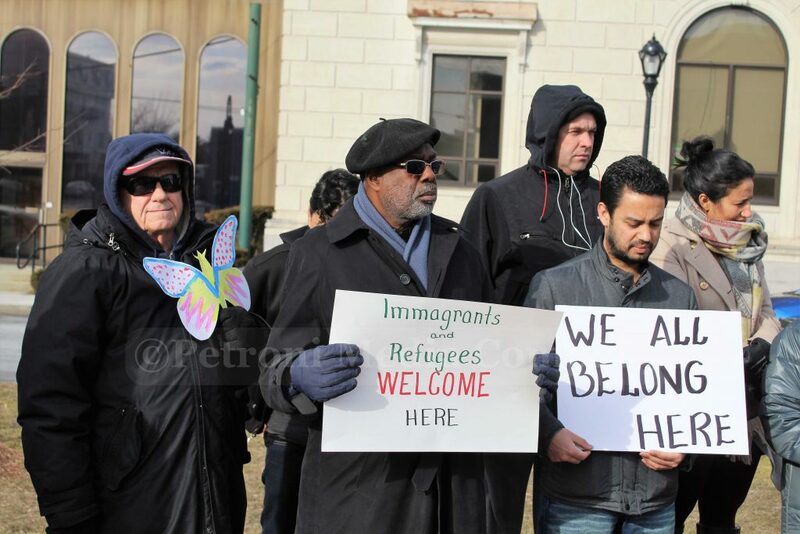 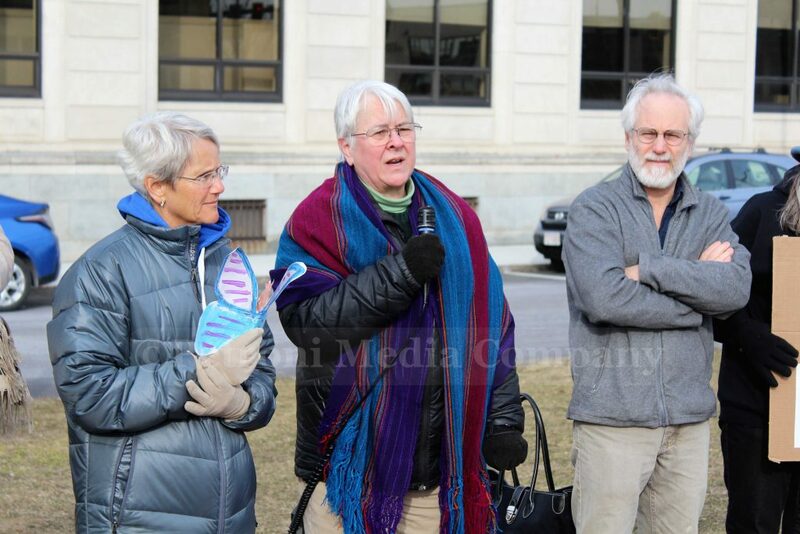 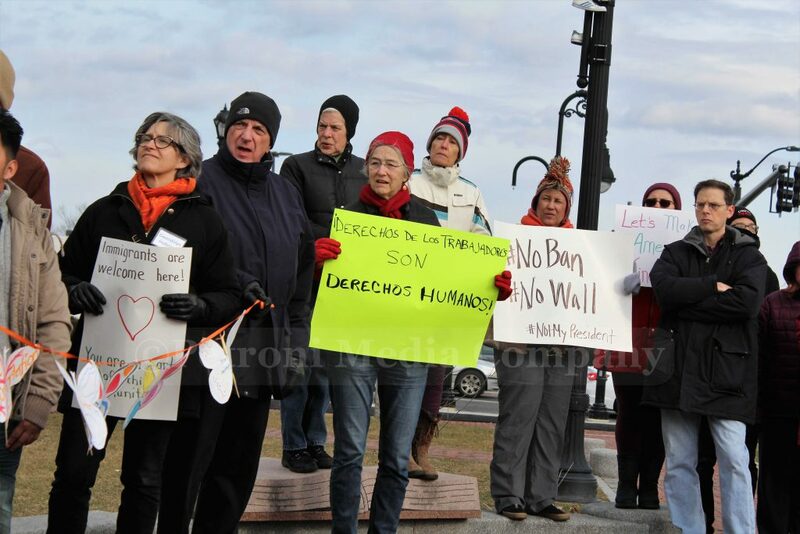 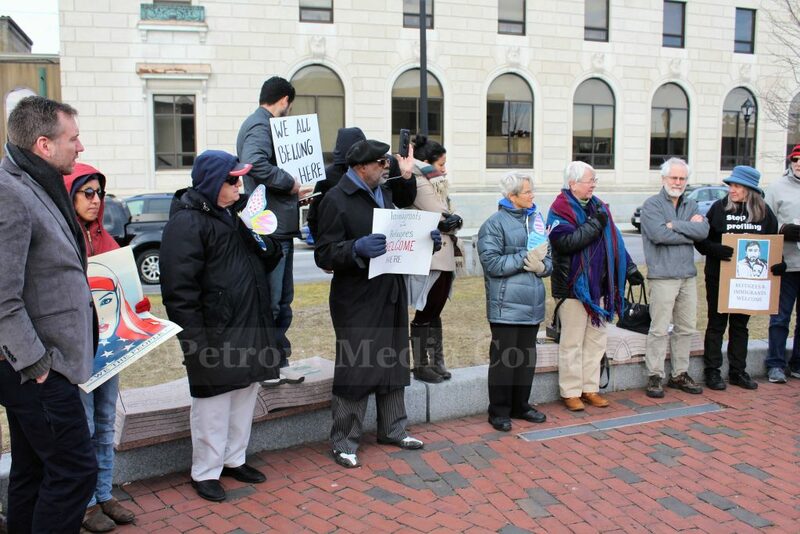 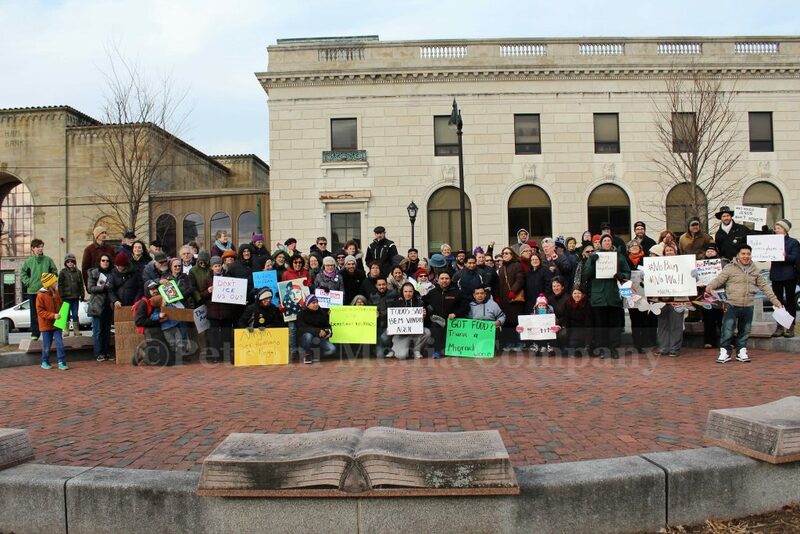 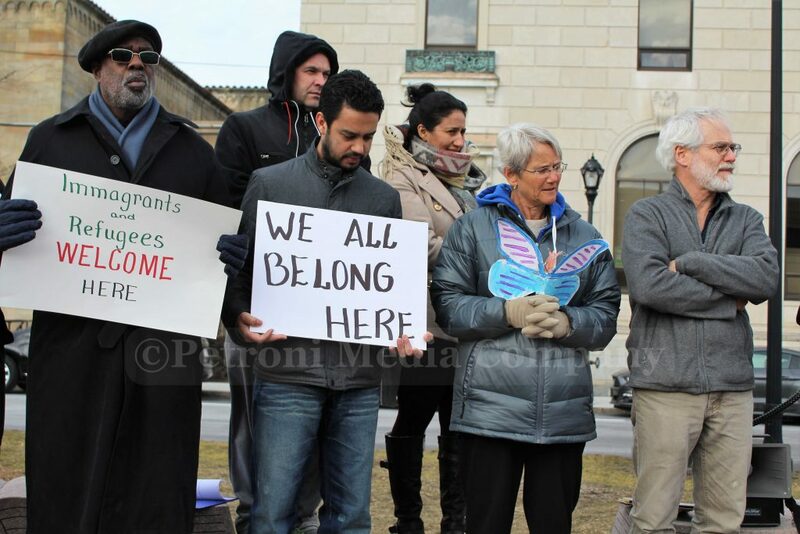 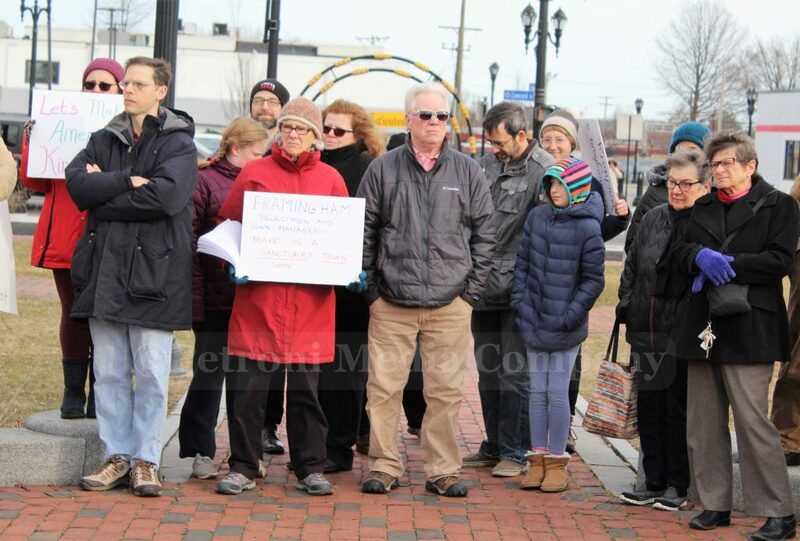 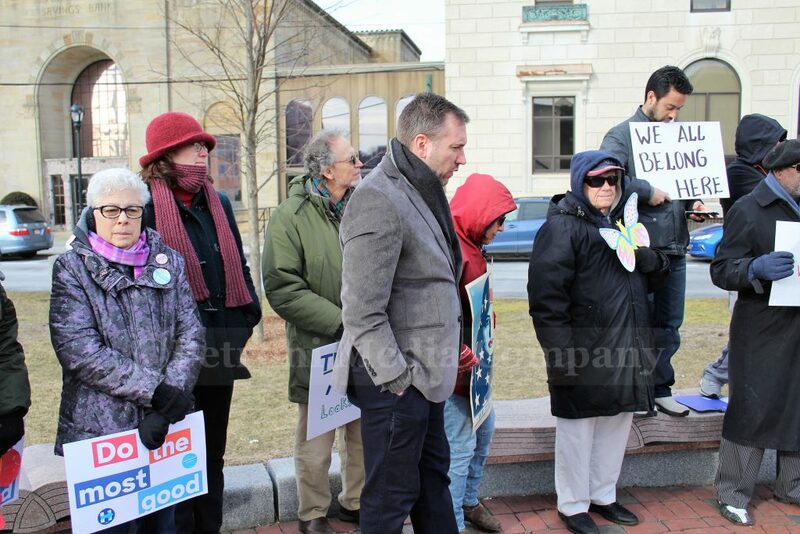 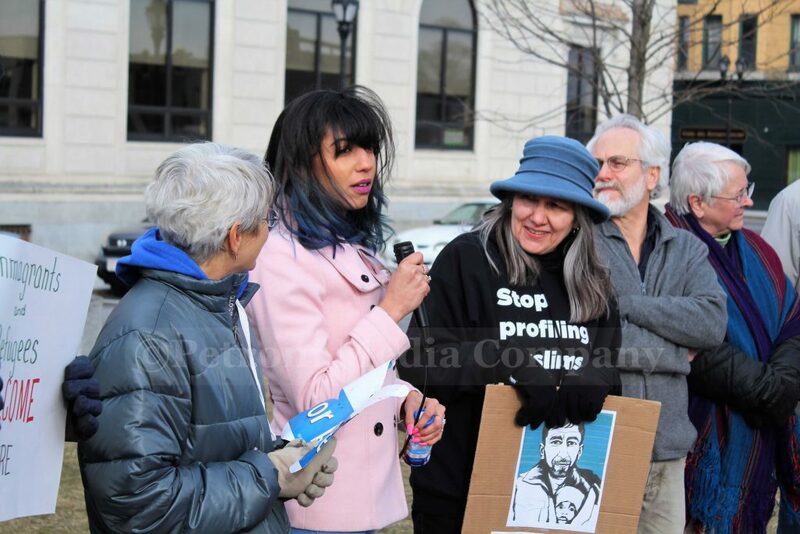 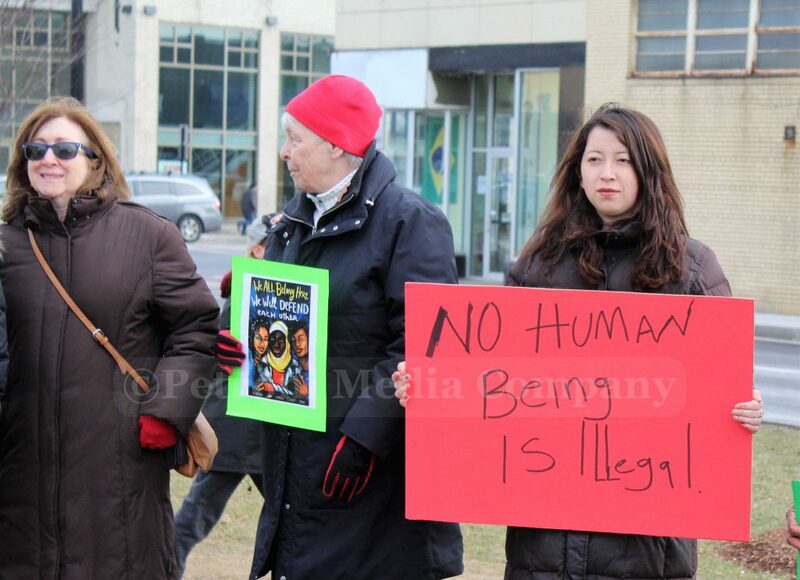 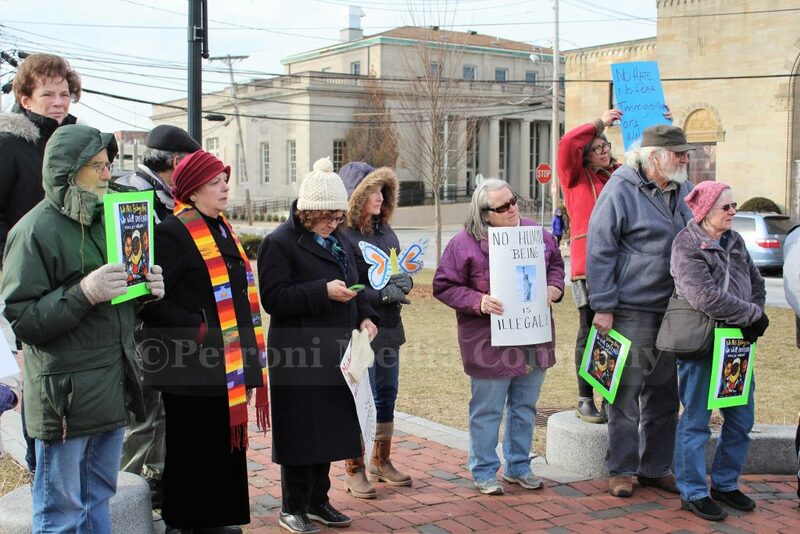 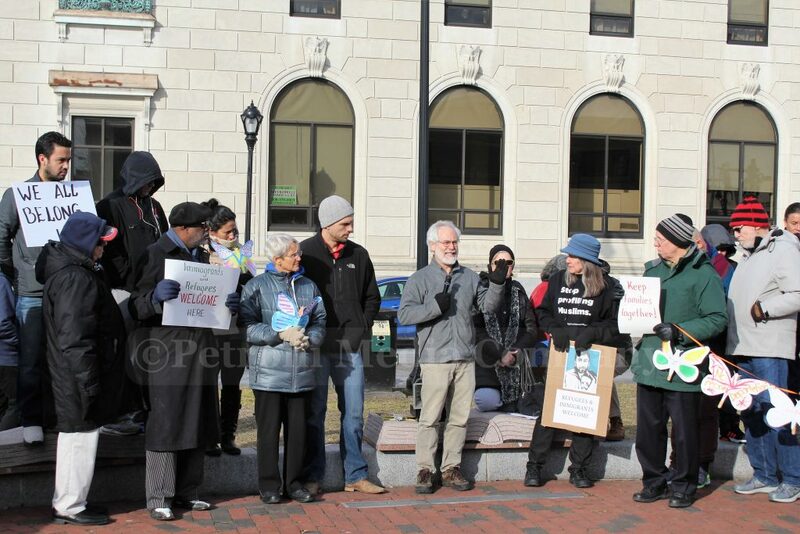 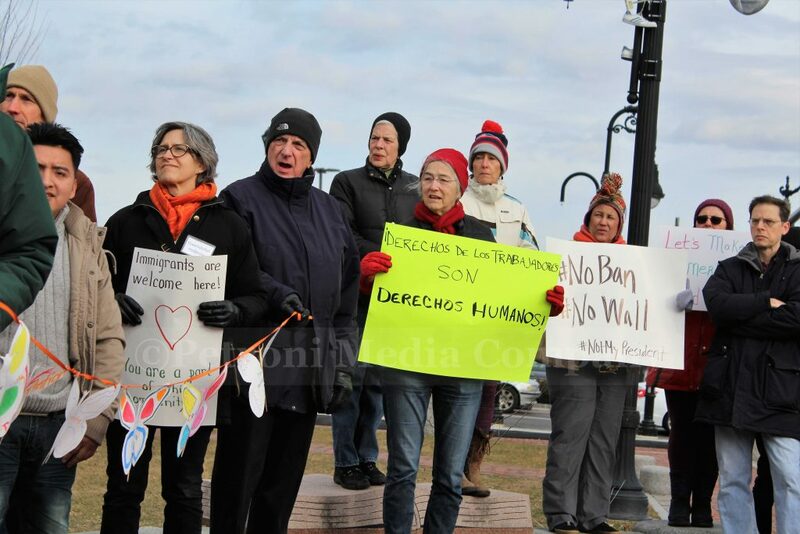 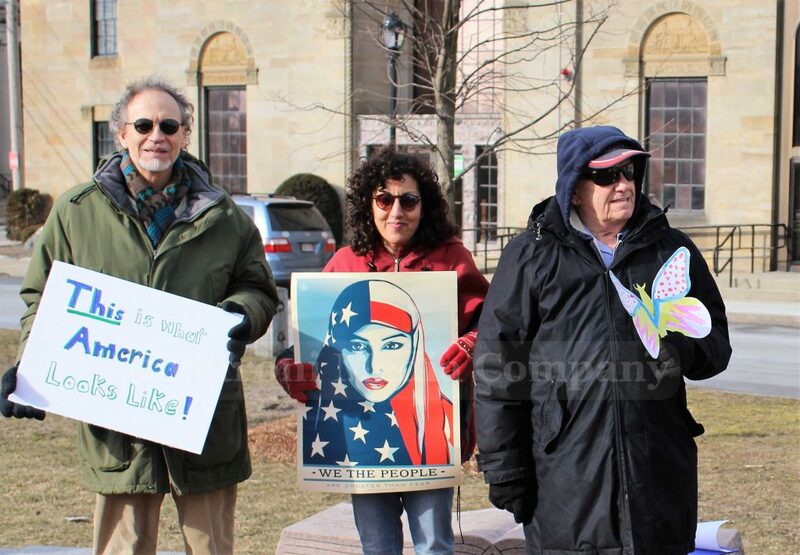 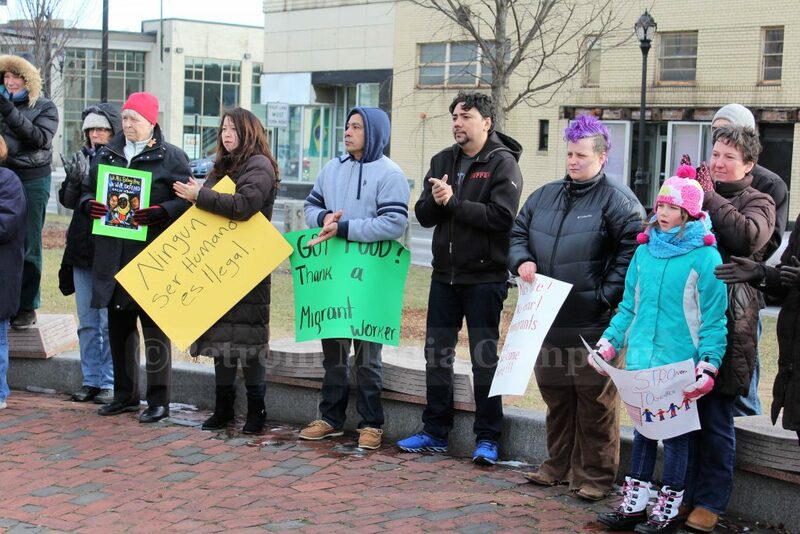 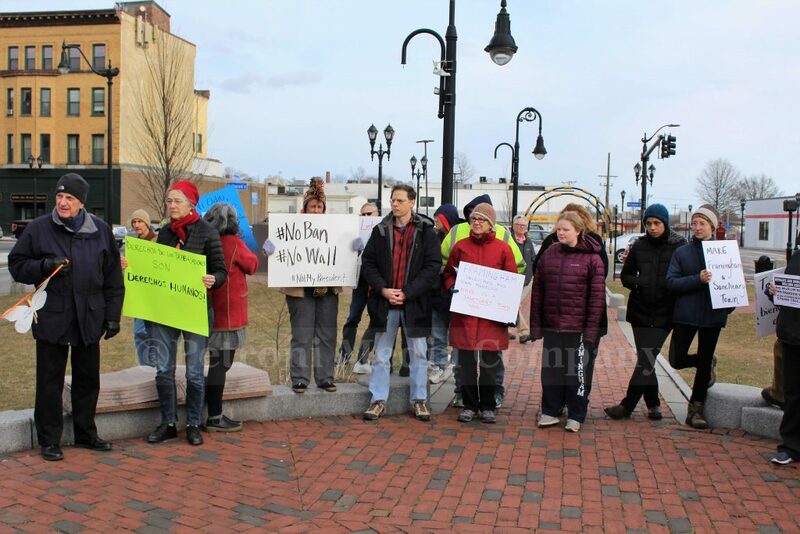 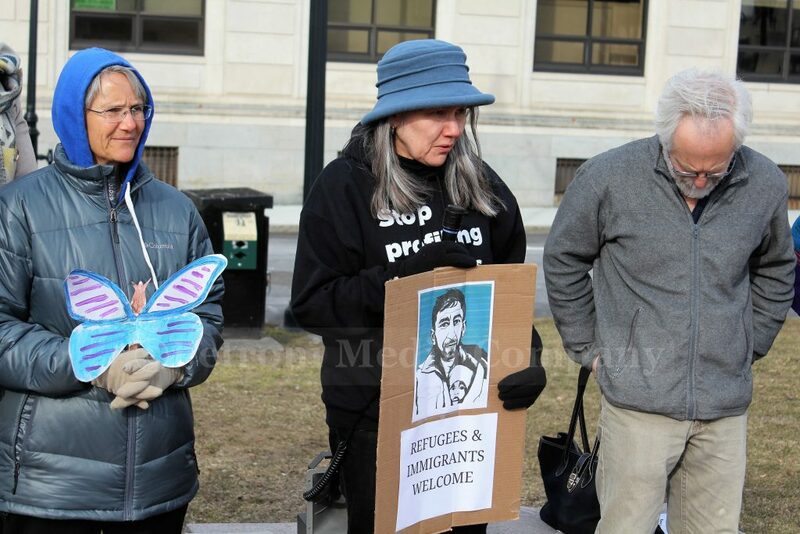 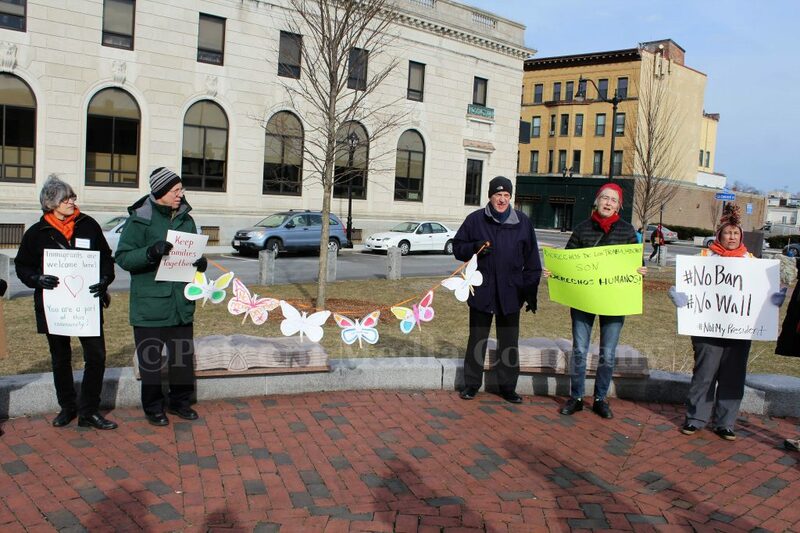 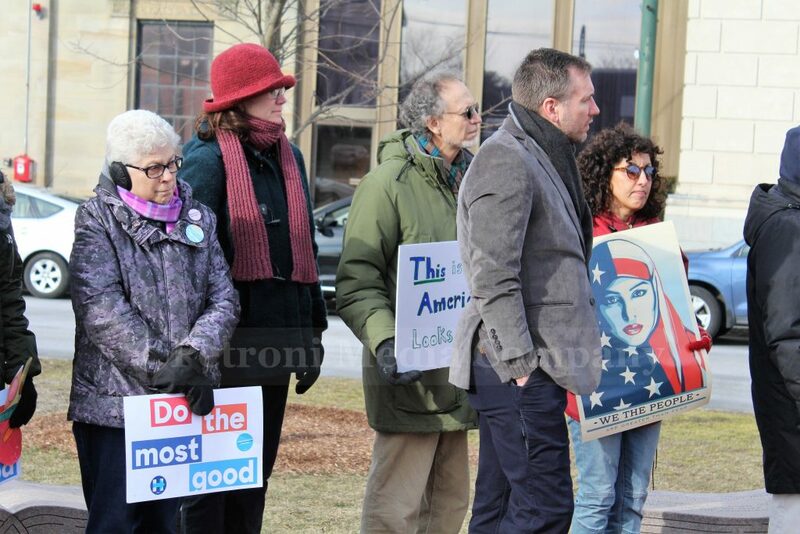 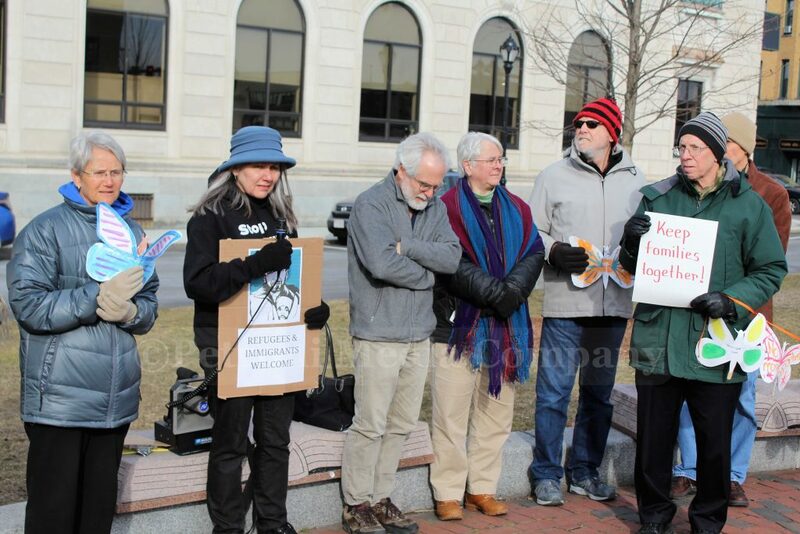 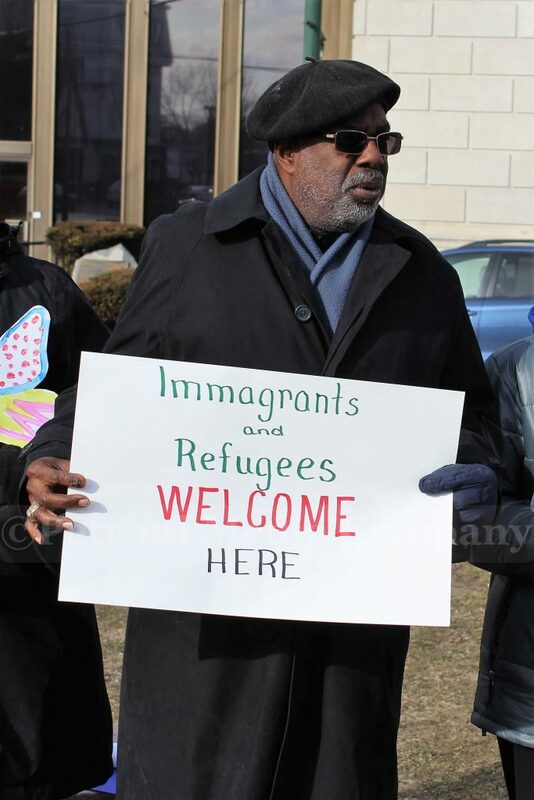 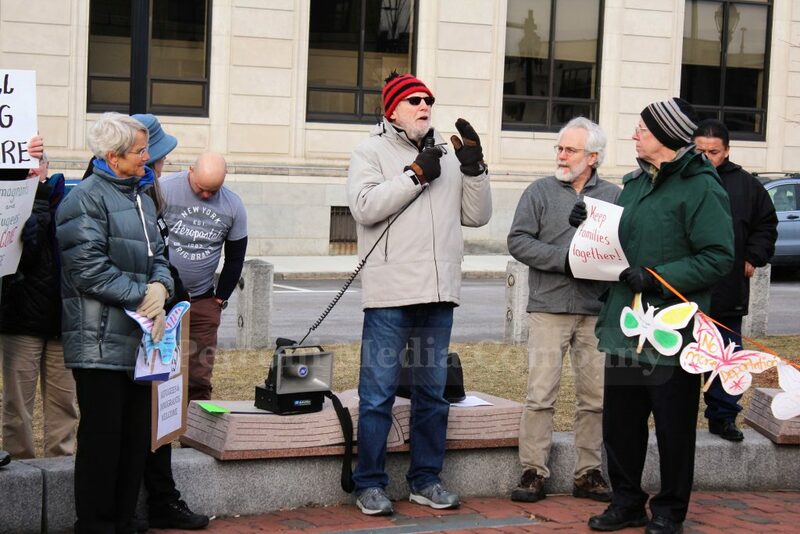 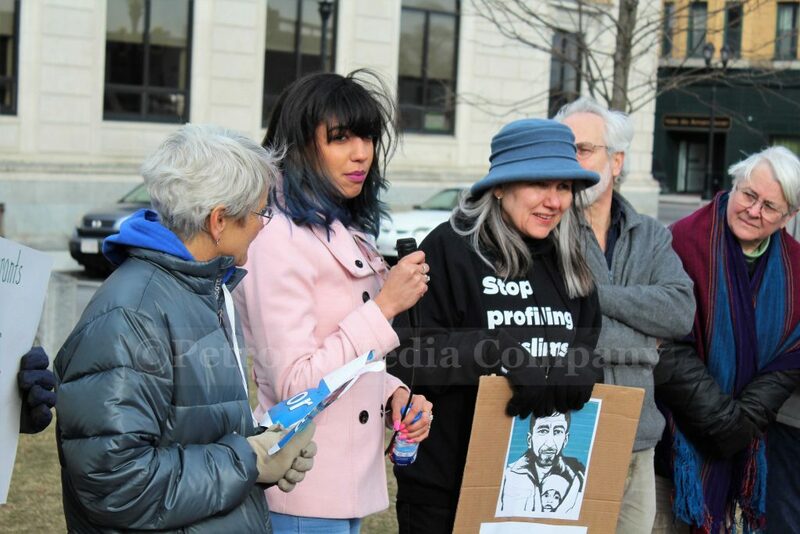 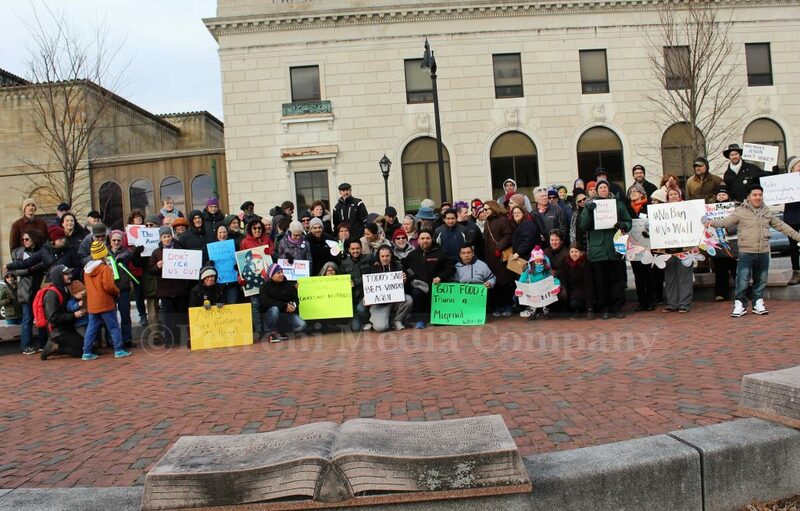 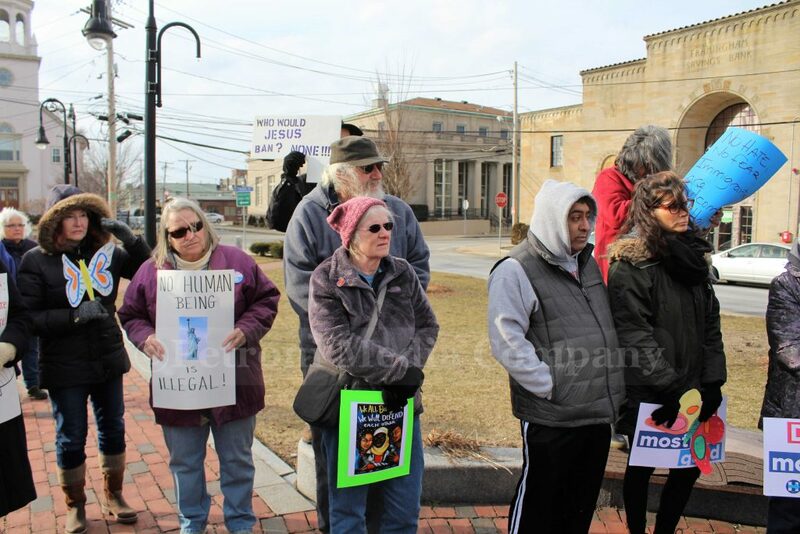 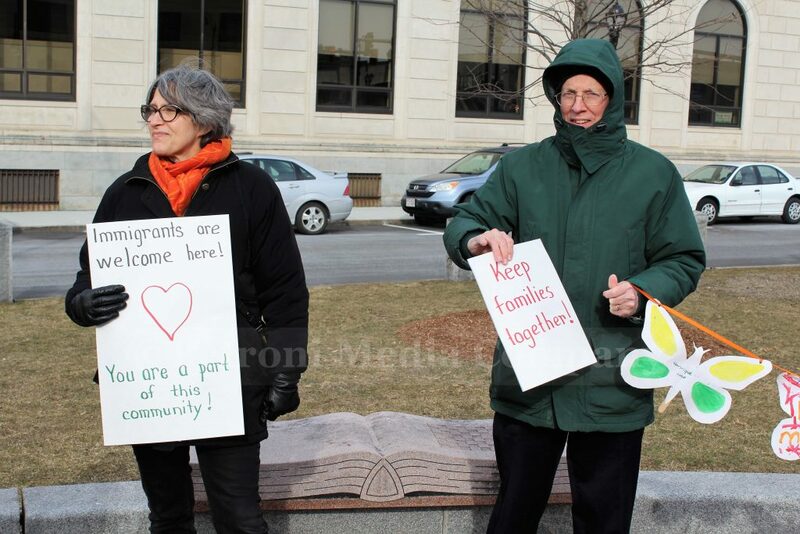 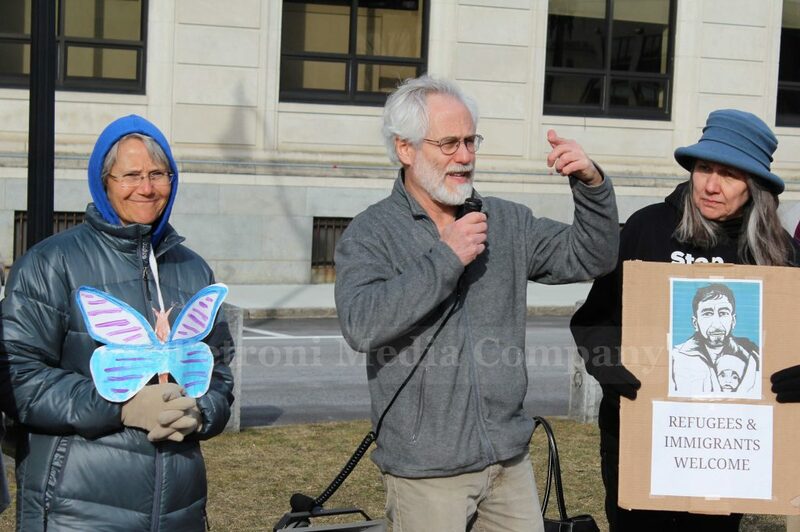 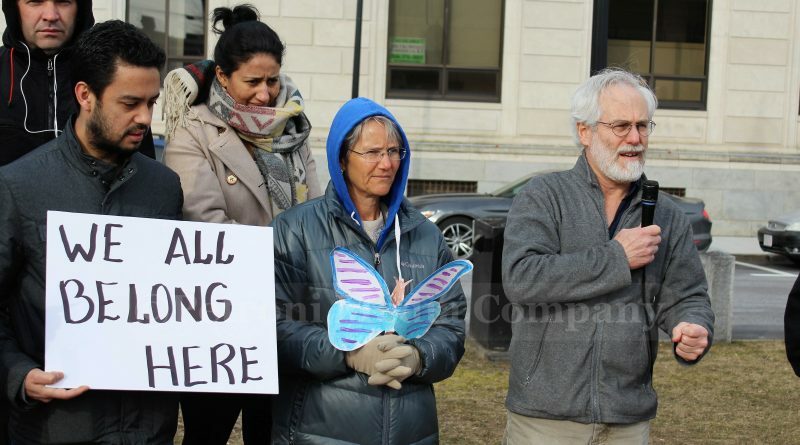 FRAMINGHAM – A teach-in rally to support local immigrants in Framingham was held Sunday, February 5 at the common on Park Street. 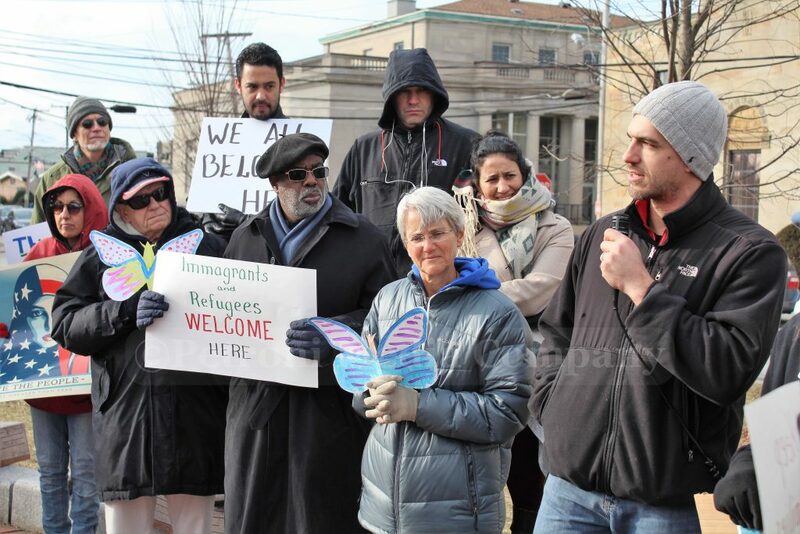 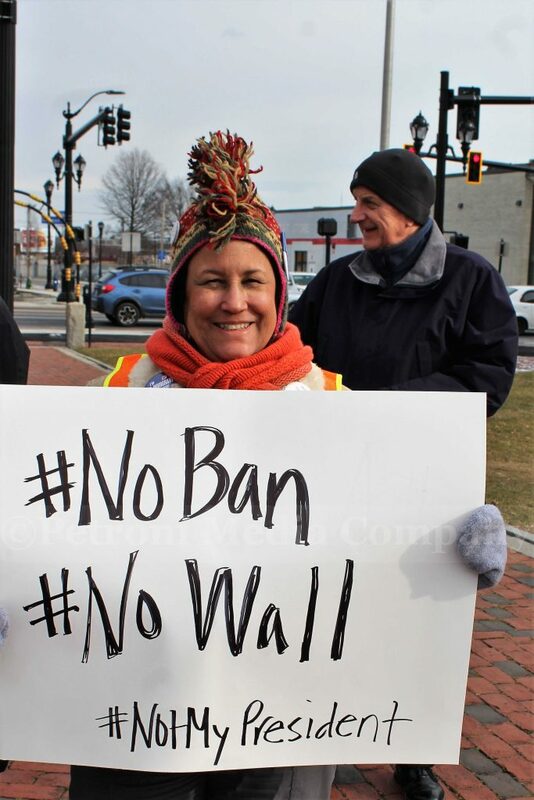 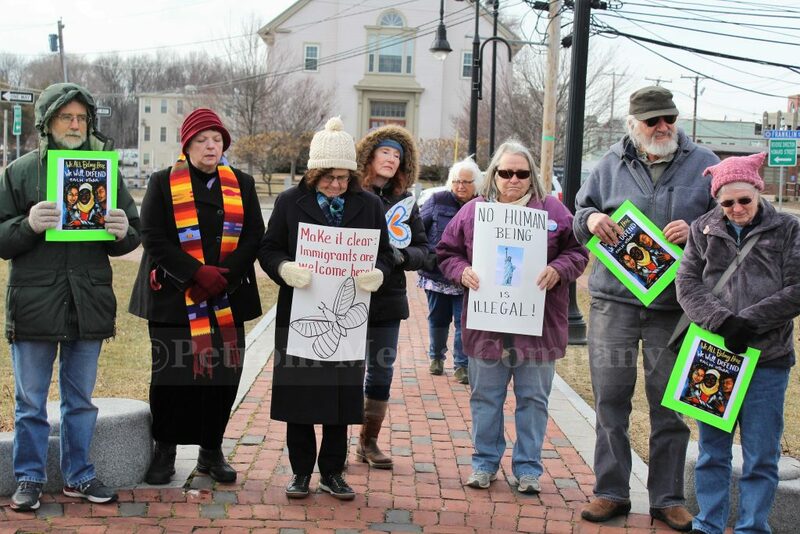 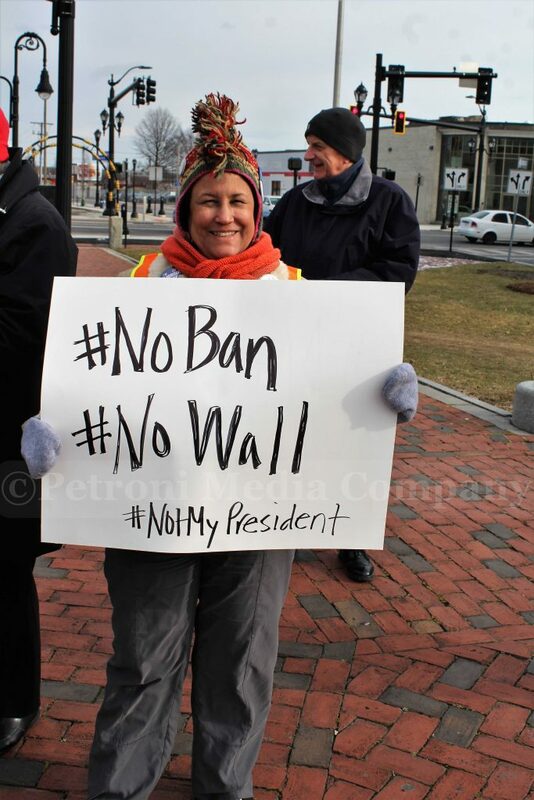 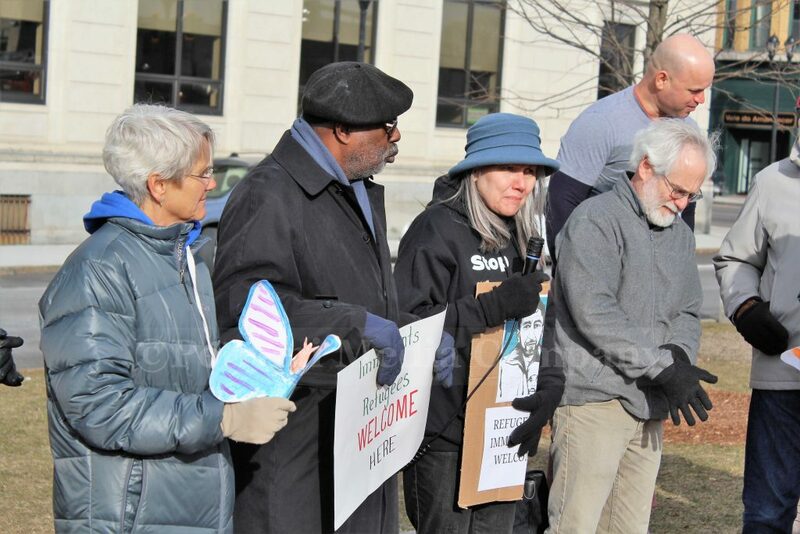 More than 150 individuals, many who live north of Route 9 and are part of the Interfaith church community, participated in the event that highlighted an increased and sustained presense of ICE (Immigration and Customs Enforcement) agents in Framingham, since the inauguration of President Donald J. Trump. 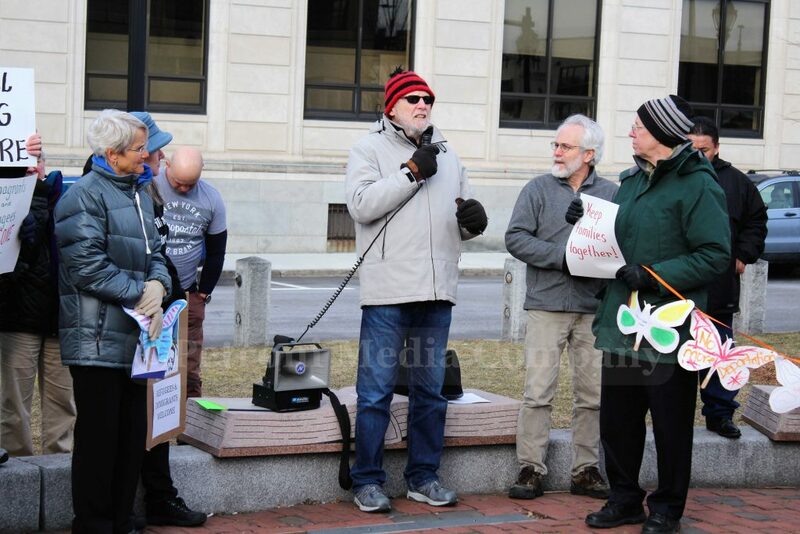 “Friday, I attended a meeting at the MetroWest Worker Center and I began to learn a little bit about what is going on in Framingham. 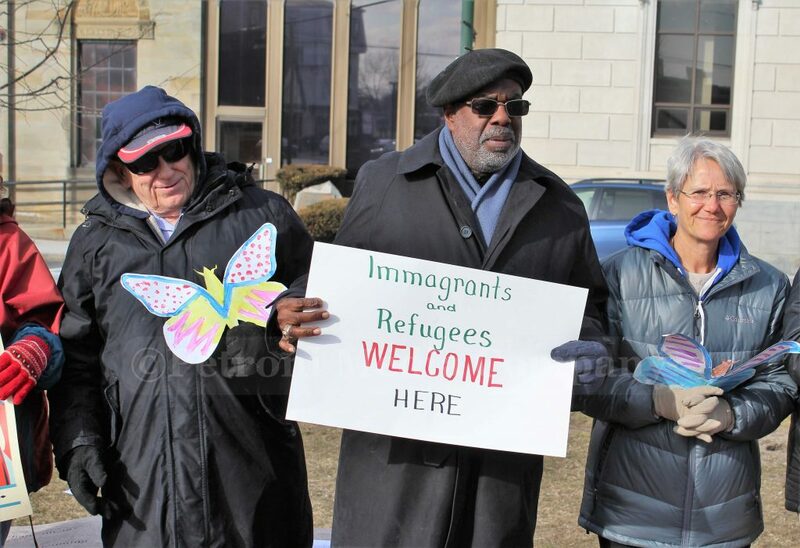 A stepped up presence from immigration officials, that is creating at atmosphere of fear and worry and isolation,” said Rev. 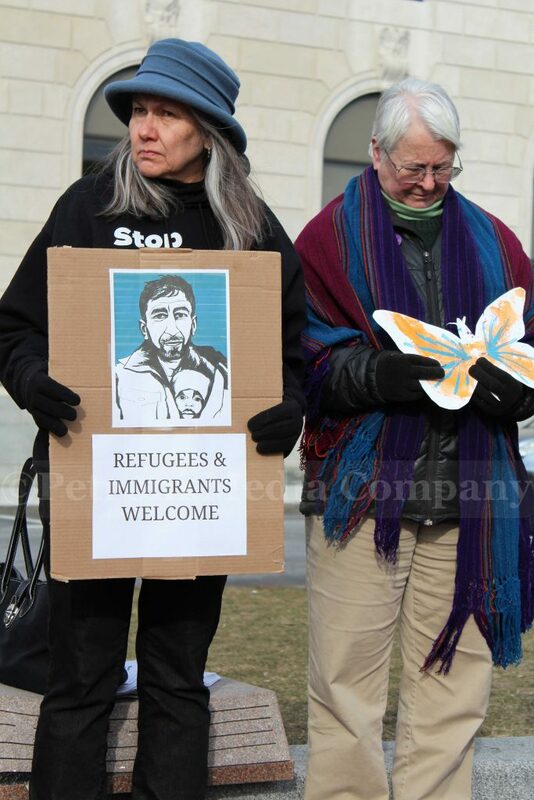 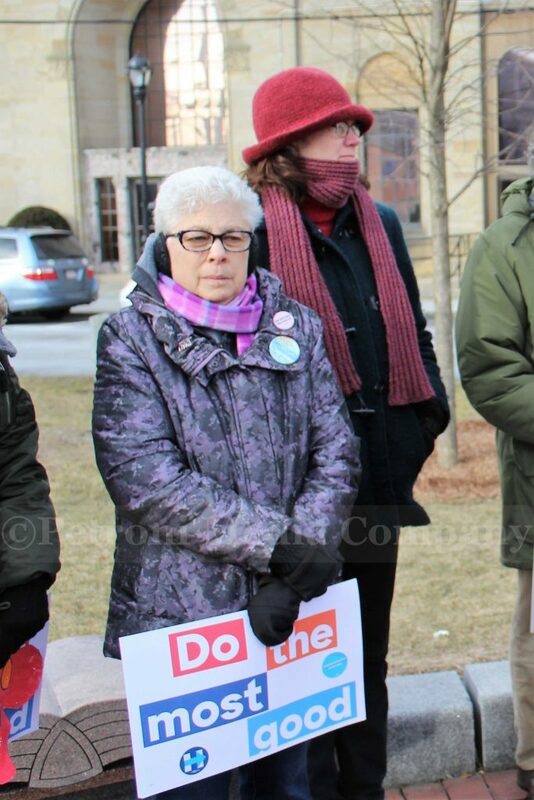 Debbie Clark of Edwards Church, and part of the Framingham Interfaith Clergy Association. 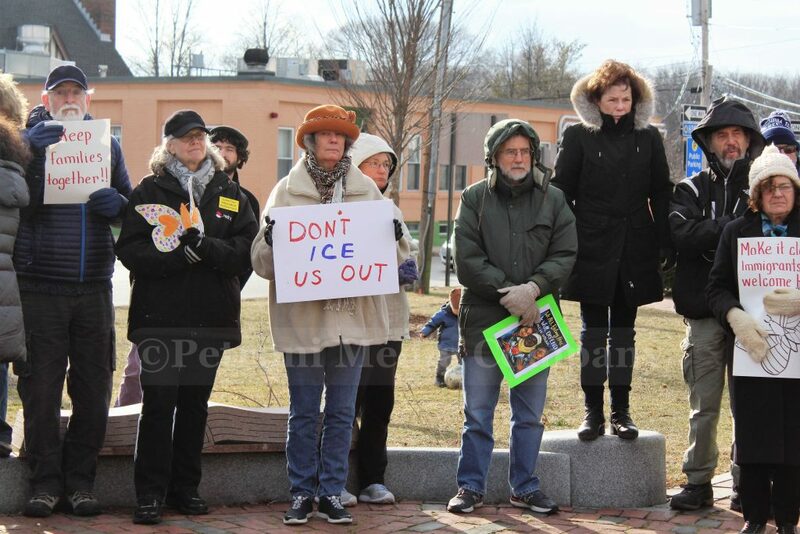 “There have been reports since last Thursday of ice presence in Framingham. 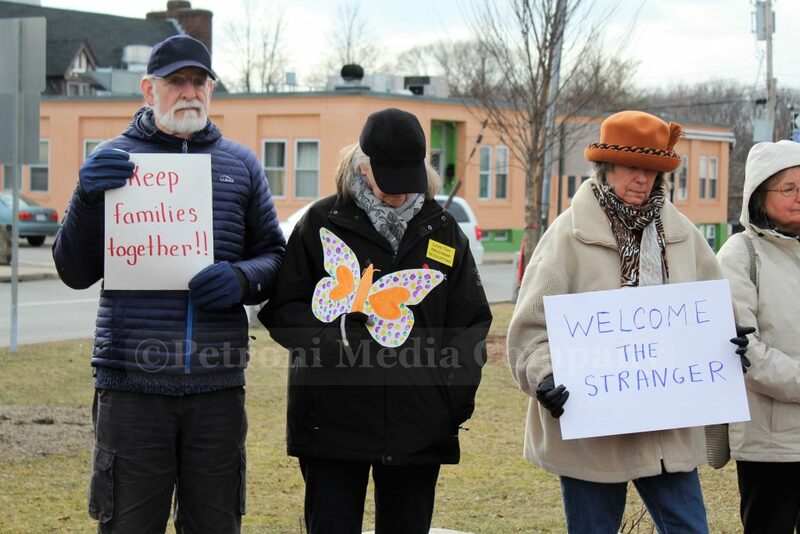 It’s not that they have ever been absent, but for more than a week it has been a daily presence here,” said Diego Low, director of the MetroWest Worker Center, located on Concord Street in Framingham. Last week, Acting Framingham Superintendent of Schools Ed Gotgart issued a statement hoping to alleve the fear of the students in his public school district, which is hope to many immigrants. 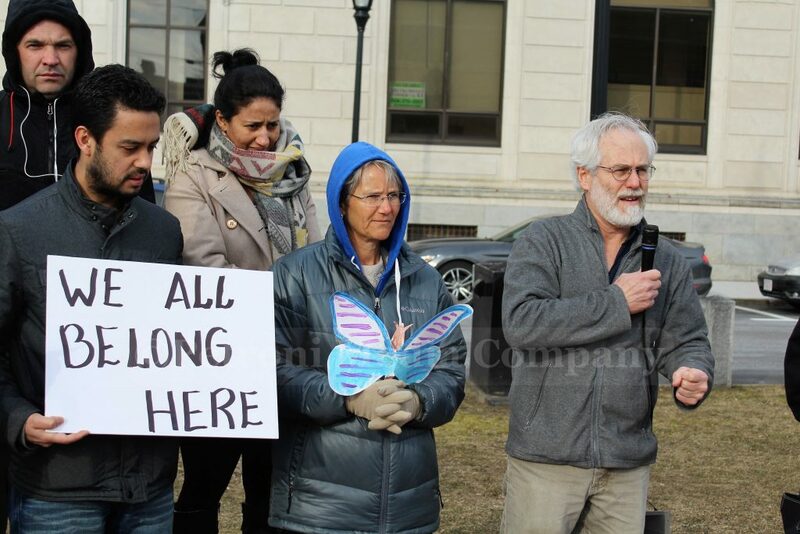 More than 75 languages are spoken among the 8,500+ students in the school district. 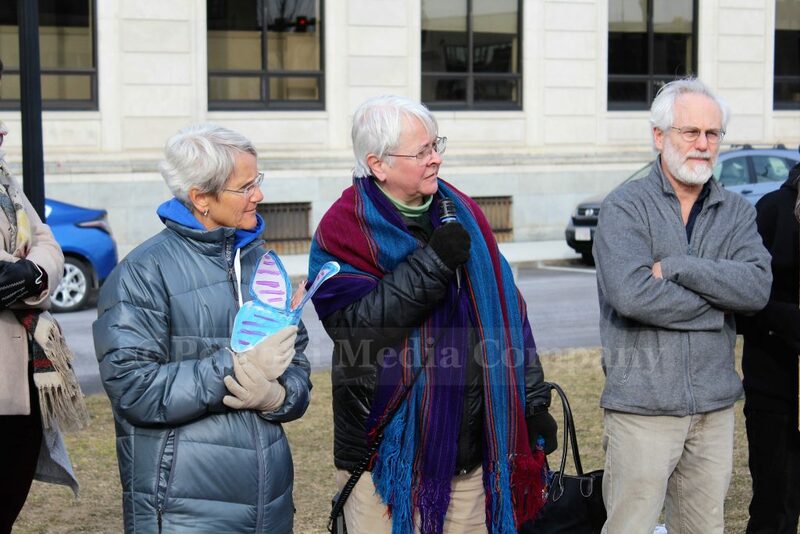 “Our schools have always been safe havens for our students and we assure you that they will continue to be so,” said Gotgart, in a letter that went out to staff and parents. 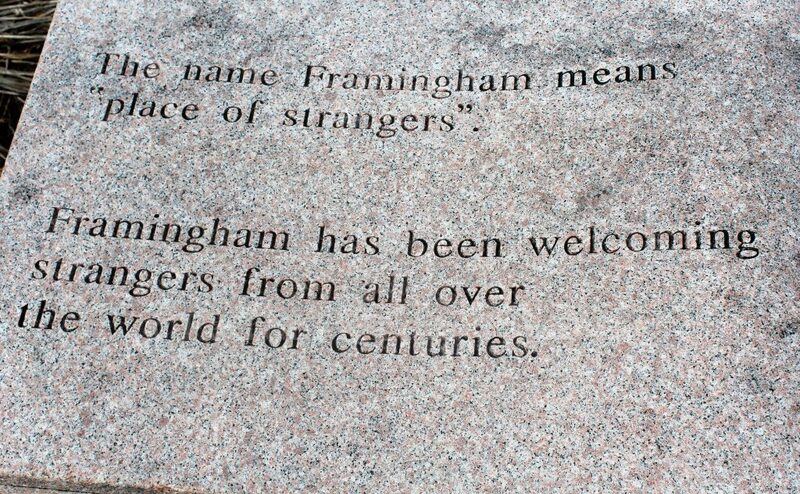 He said the Center is aware of Framingham residents, who have been “detained,” and they have a list of names of those individuals. 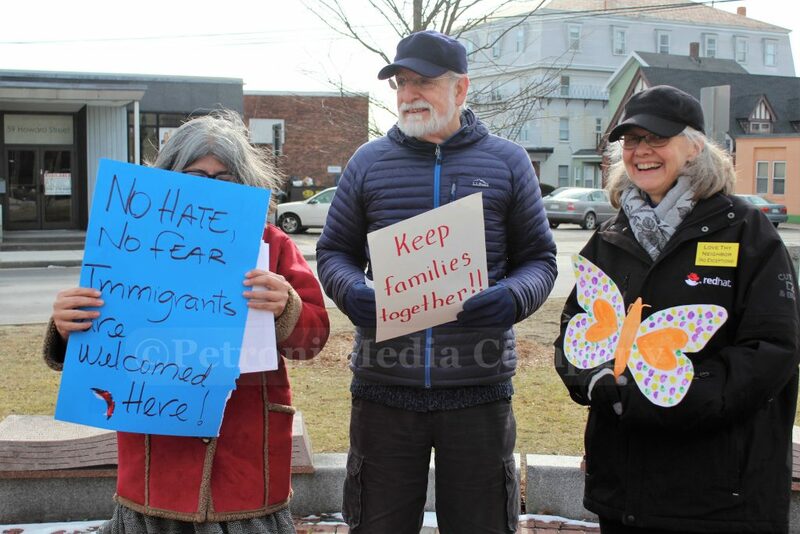 There have been reports of ICE agents inside Framingham apartment complexes, at businesses along Hollis Street, and one report of an incident with an ICE agent at Market Basket parking lot in Ashland, said several at the rally Sunday. 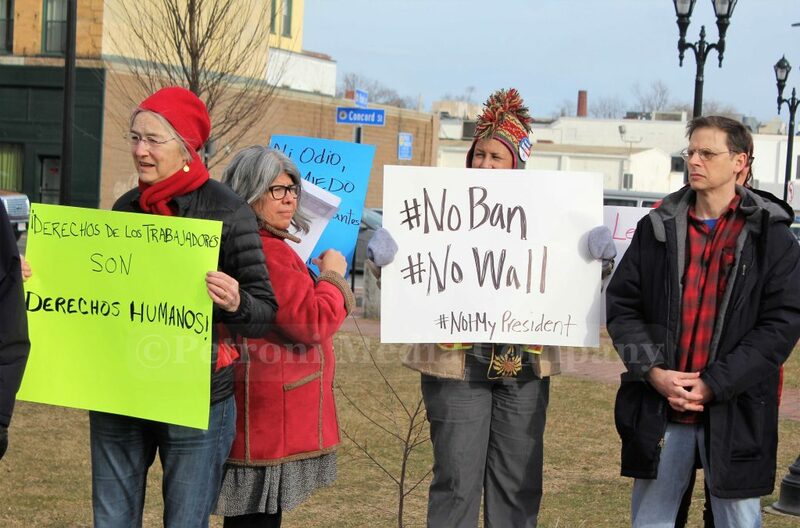 It was mentioned at the rally of ICE agents arresting people on the streets and fingerprinting them in public. 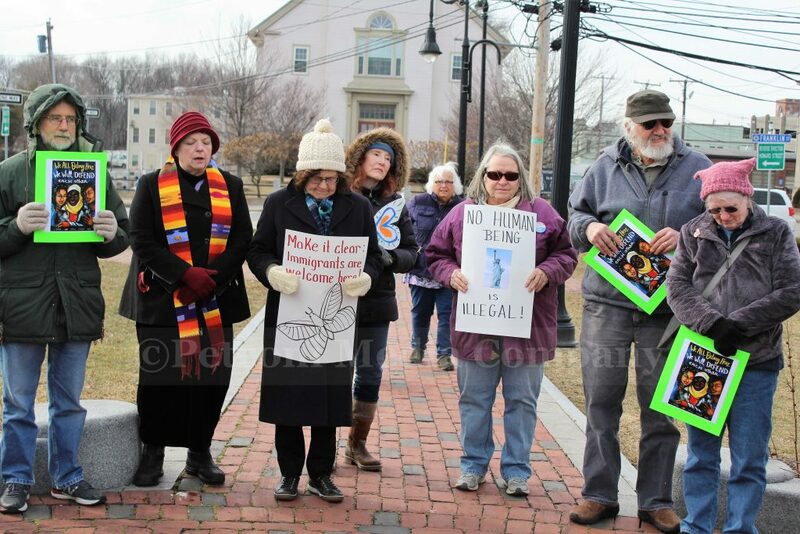 MetroWest Legal Service attorney Kathryn Condon Grace said she has clients, who have been questioned by ICE and detained. 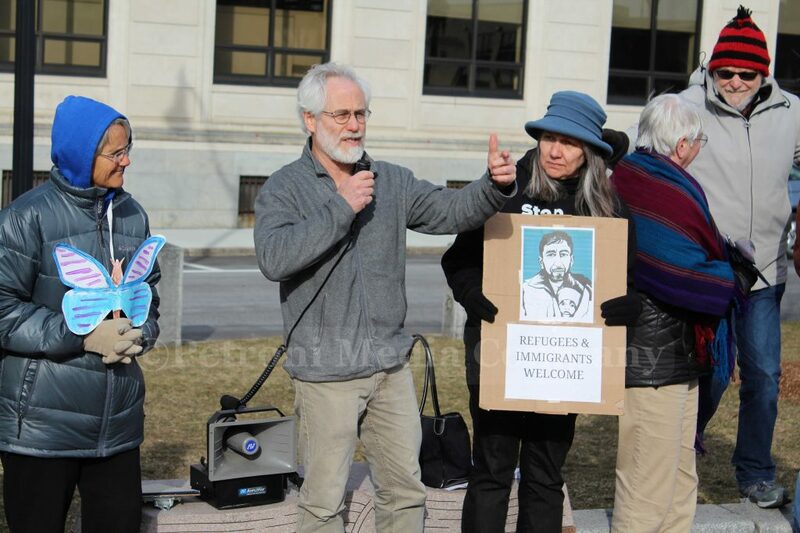 “The folks, who they are detaining, don’t have much of a voice,” said Low. 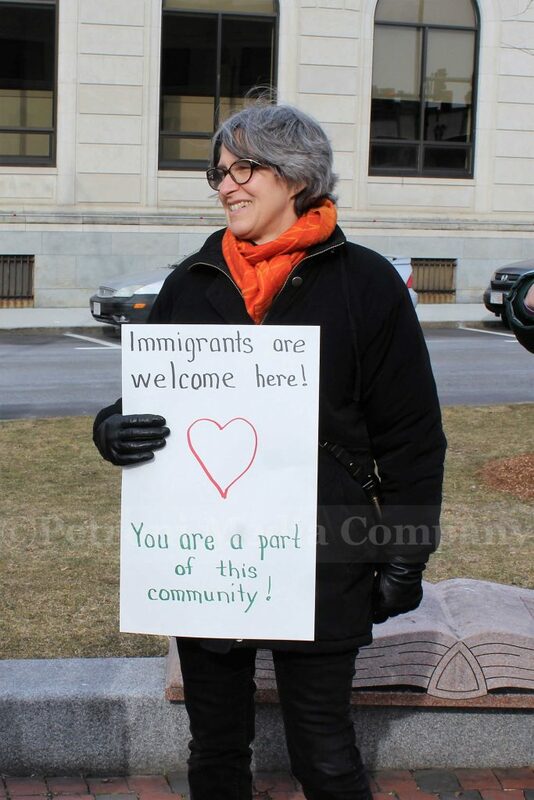 Grace said her Framingham agency is working to educate immigrants and citizens of their rights. 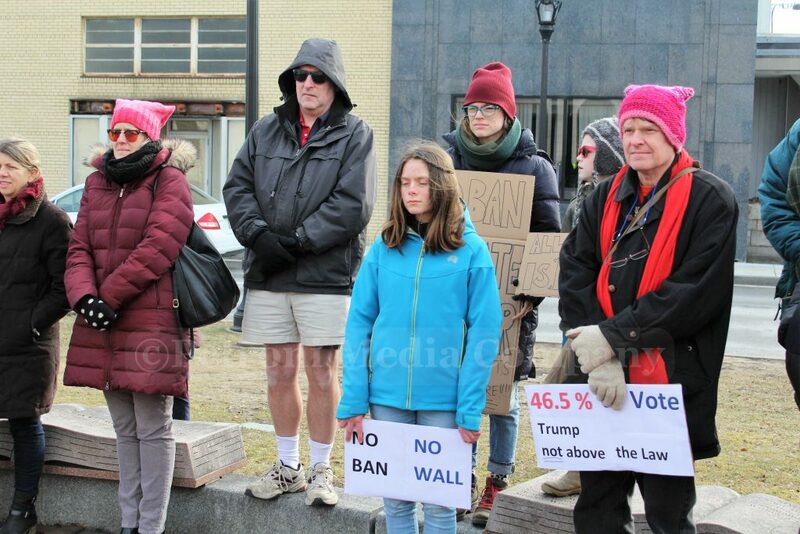 “That would have given us the ability to have some idea of what is happening,” in town, said Low. 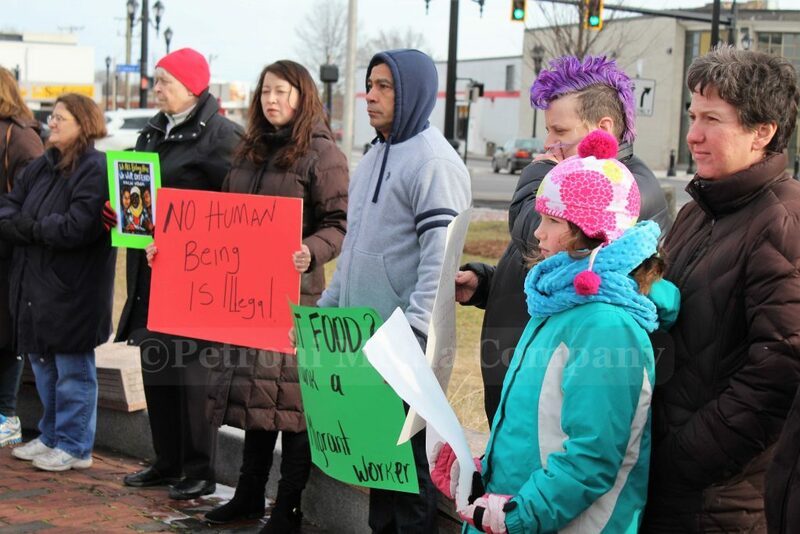 Acting Police Chief Steve Trask said that policy is not the current policy, Low told the crowd Sunday. 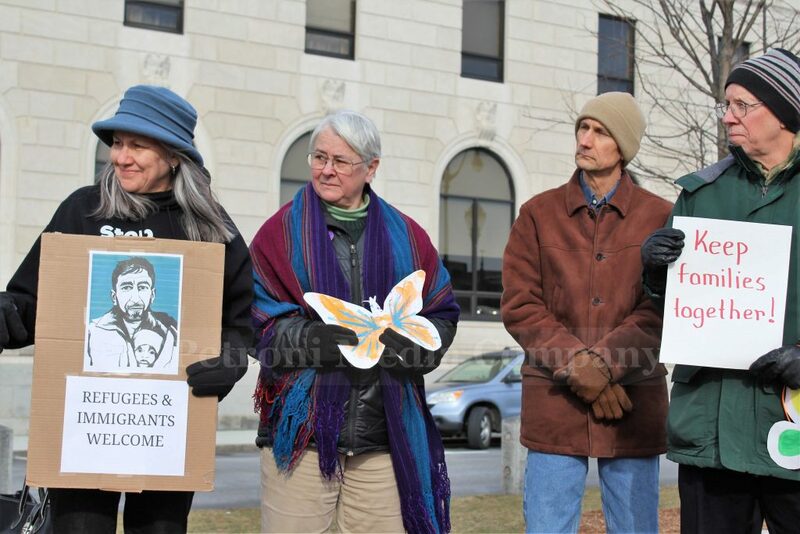 “In fact, he informed us on Friday that he had been assured on Wednesday that there had been no detentions in the previous week,” said Low. 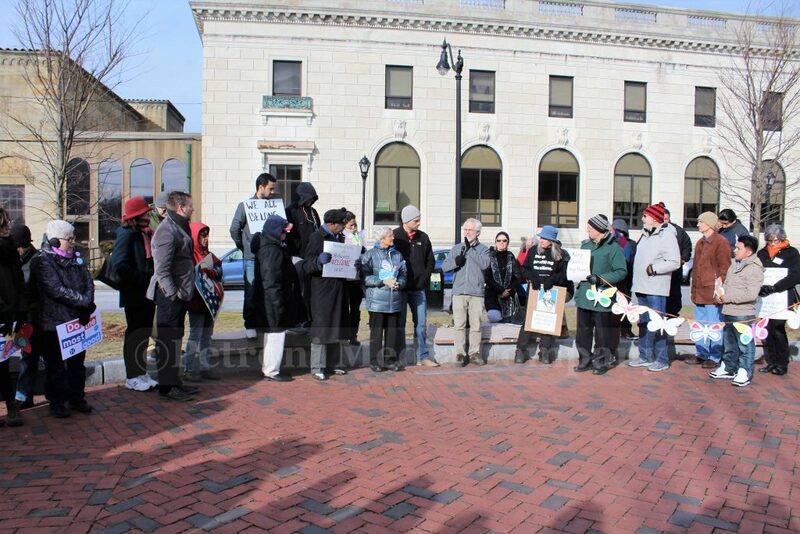 “We have the names of any number of people who have been detained … we take Chief Trask at his word,” but that doesn’t say a lot for the way ICE operates in this community, said Low. 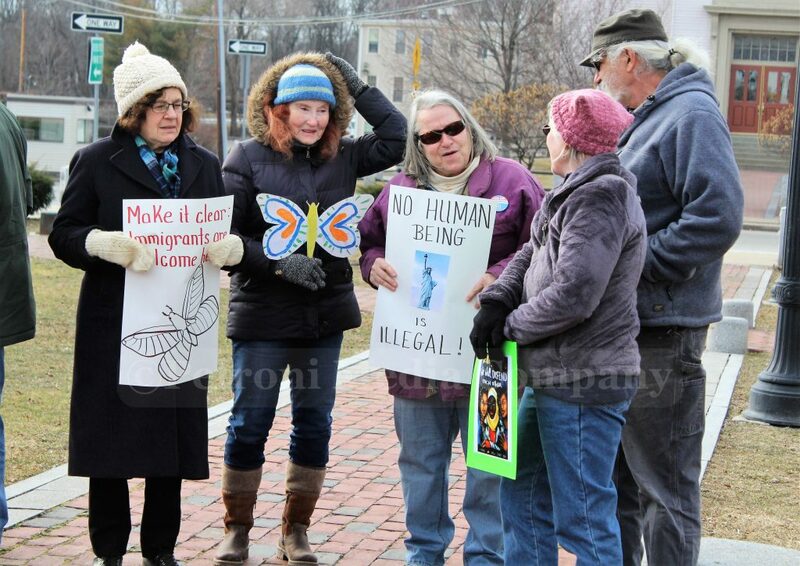 Grace said the ICE enforcement has been concentrated in specific neighborhoods south of Route 9. 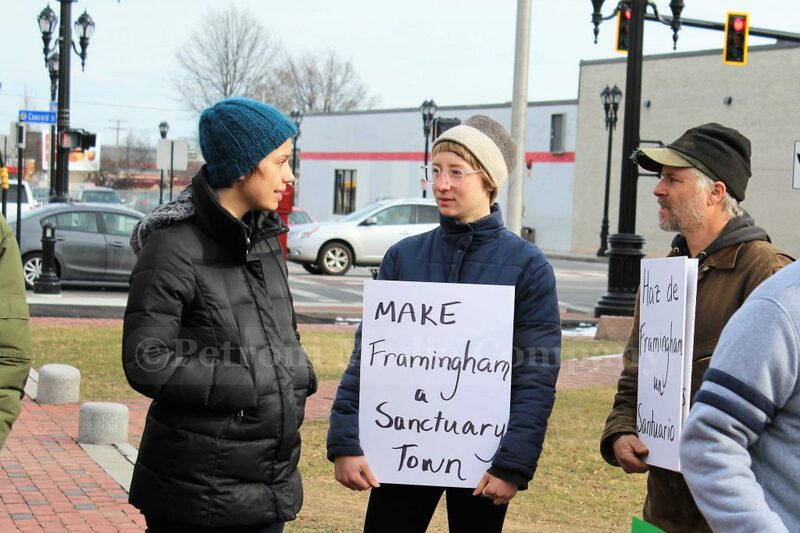 Lowe said immigrants, specifically the Brazilian, community contributed to the revival of downtown Framingham. 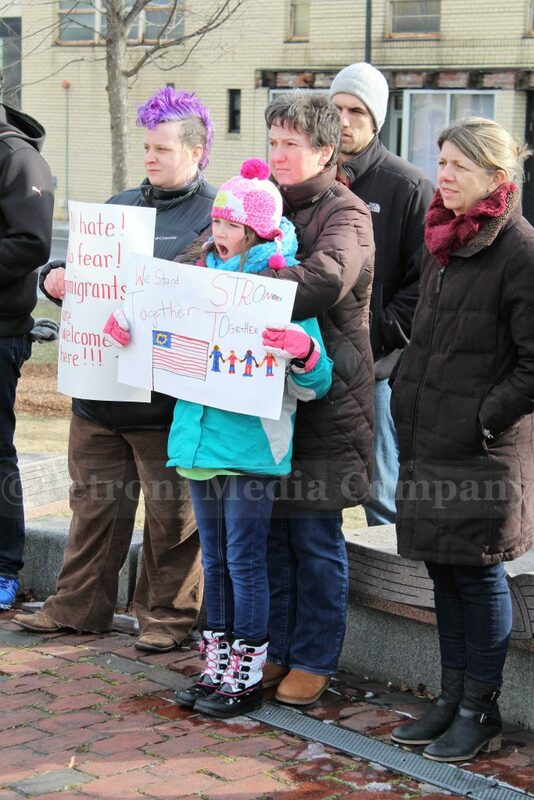 Several in the crowd spoke of the need for Framingham to become a sanctuary city, like Boston and Somerville. 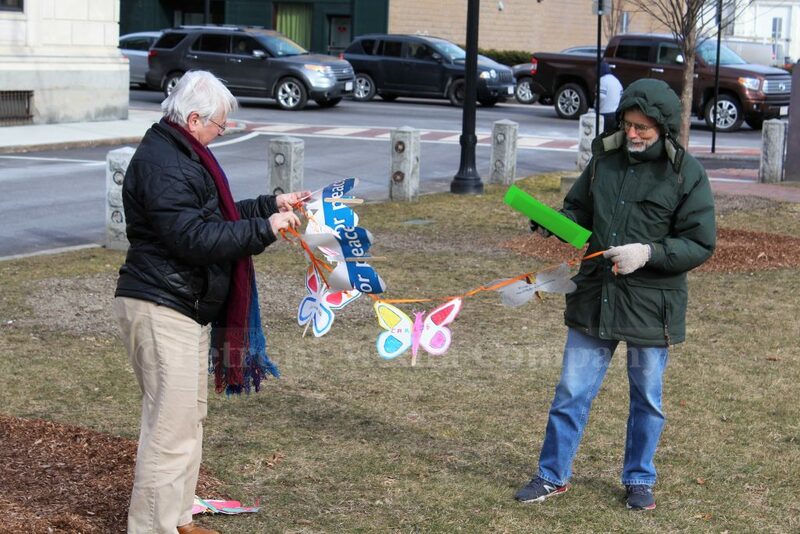 Many carried butterflies, which symbolized migration, like the migrations of hundreds of thousands of immigrants to America since the country was founded. 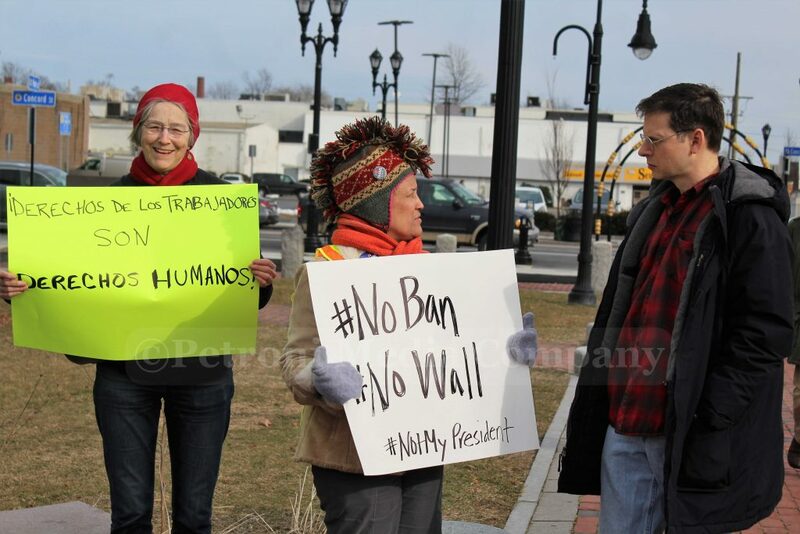 Group organizers, began planning the event on Super Bowl Sunday on Friday, and said they plan to hold future events, specifically ones to educating refugees, migrant workers, and undocumented workers in Framingham. 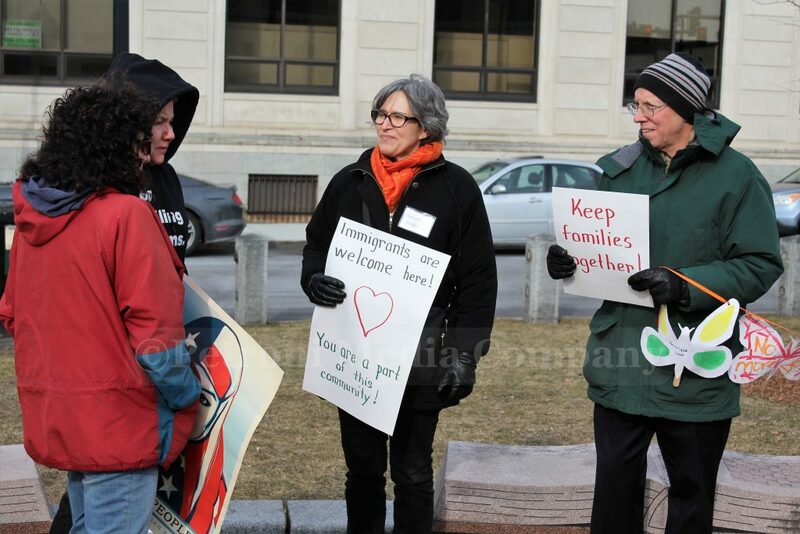 “It’s important to keep families together,” said one of the attendees from Sudbury yesterday.